File Photo - A man stands next to an electronic board showing stock prices in Tokyo, Japan, August 18, 2016. TOKYO - Asian stocks were mostly steady on Wednesday after Wall Street again rose to record highs, although movements were limited as a wait-and-see mood prevailed before the Federal Reserve reveals its monetary policy stance later in the day. The Fed announcement is due at 1800 GMT (3 am Thursday Tokyo time). It is widely expected to keep rates steady after a two-day meeting but announce it will begin paring its bond holdings, with reductions likely to start in coming months. The financial markets will also sift through the “dot plot” representing Fed policymakers’ rate projections for any hints of a rate hike in December. MSCI’s broadest index of Asia-Pacific shares outside Japan .MIAPJ0000PUS was down 0.1 percent. 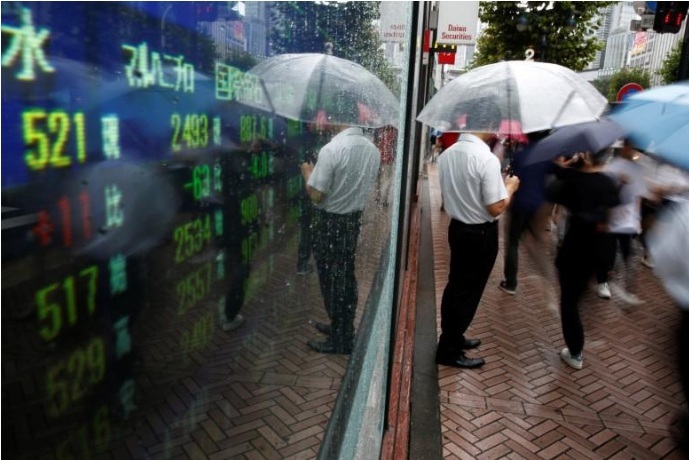 Japan's Nikkei was flat and South Korea's KOSPI was off 0.2 percent. “A benign outcome for equities would be the Fed going somewhere in between being too passive on reducing its bond holdings and too aggressive in hiking interest rates,” said Soichiro Monji, chief strategist at Daiwa SB Investments in Tokyo. “There may be some speculation towards the Fed sounding slightly dovish, but over the few weeks hawkish rhetoric has come into vogue globally as demonstrated by the Bank of Canada and Bank of England,” he said. The Canadian central bank hiked interest rates this month and left the door open for more tightening, while a BoE policymaker hinted last week that it might need to raise rates in the coming months. The dollar hovered in close distance of an eight-week high against the yen, buoyed with U.S. Treasury yields having risen to one-month highs before the Fed’s policy announcement. The greenback was little changed at 111.640 yen after touching 111.880 overnight, its highest since late July. The 10-year Treasury note yield US10YT=RR stood close to 2.246 percent, the one-month peak set the previous day. The euro was flat at $1.1992 after popping to an eight-day high above $1.2000 overnight. The dollar index .DXY against a basket of six major currencies was up fractionally to 91.868. In commodities, crude oil prices rose, remaining buoyant ahead of Friday’s meeting between the Organization of the Petroleum Exporting Countries and non-OPEC producers to discuss the state of their 1.8-million barrel-per-day supply cut deal. Brent crude futures LCOc1 were up 0.45 percent at $55.38 a barrel. Asian stocks were mostly steady on Wednesday after Wall Street again rose to record highs, although movements were limited as a wait-and-see mood prevailed before the Federal Reserve reveals its monetary policy stance later in the day.